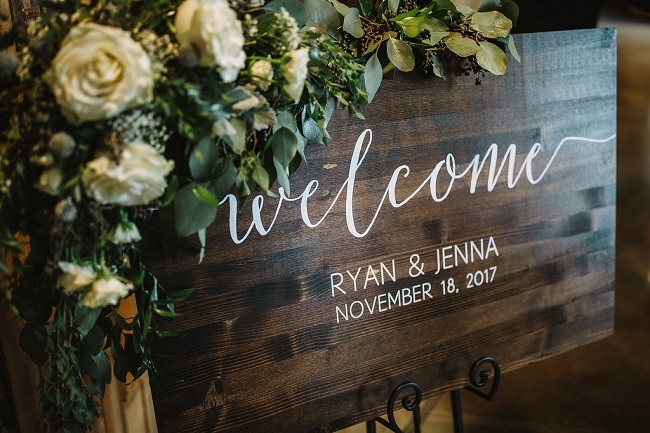 We so enjoyed the wedding planning for Ryan and Jenna who were married last November and were thankful we were able to keep the surprise and not let it slip!! 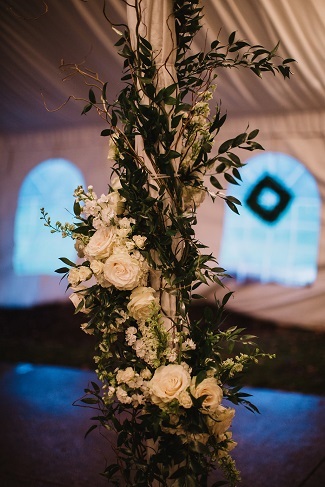 When Jenna’s mom Shelly got married, her mother ordered a special floral backdrop as a surprise and it meant so much to her that she wanted to do something similar for her daughter!! 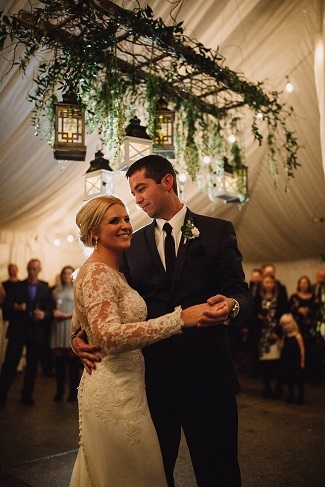 As Jenna had already chosen a floral pergola as a backdrop for her wedding, Shelly came up with an idea to create a floral surprise over the dance floor which was in a tent connected to the Bloomington Country Club. 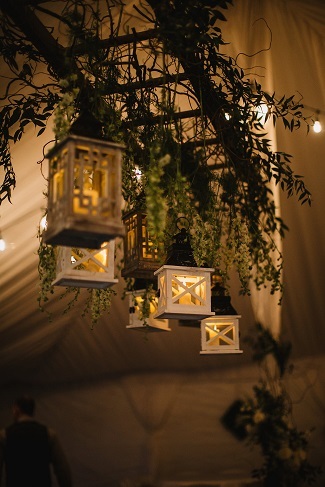 A suspended decorated ladder with hanging lanterns and covering the tent poles with greens, curly willow and white blooms created a beautiful focal for their first dance! A second surprise was a special backdrop behind the wedding party table (described below)!! When Jenna came for her consultation she knew exactly what she wanted and was organized with inspiration photos of each item. 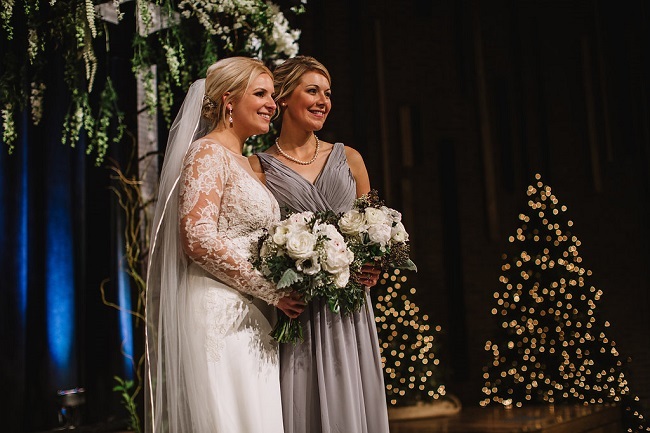 Since her sister was just married a year earlier, she had learned a lot from that experience. They asked Ryan’s carpenter cousin to build them a pergola which would be something they could keep and also personalize their wedding day with. 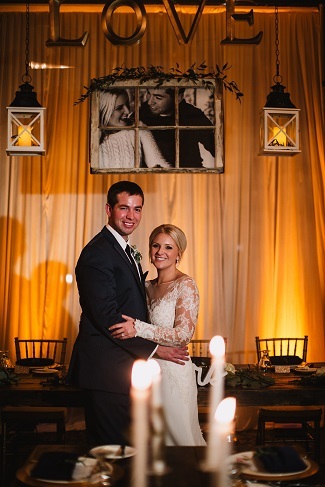 They used the pergola backdrop as their inspiration and built their day around the pergola decor for simple elegance with touches of deep family importance. This beautiful pergola traveled all the way from Colorado where Ryan’s cousin lives. 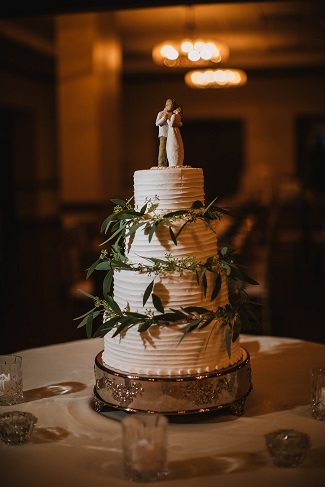 We covered it with curly willow and greens, then hung white blooms to create the look based off of her inspiration photo. 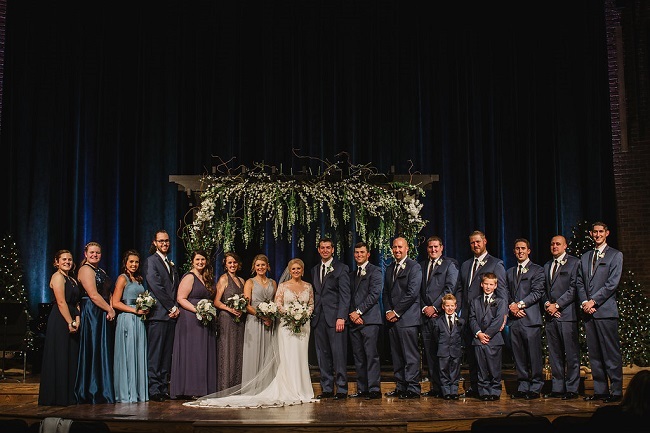 Because she asked her best friend from nursing school, Joe, to be in her wedding party, she had each of her attendants choose a style of dress they were comfortable in and was in the blue, silver & charcoal color palette so her guy friend wouldn’t totally stand out among the gals!! 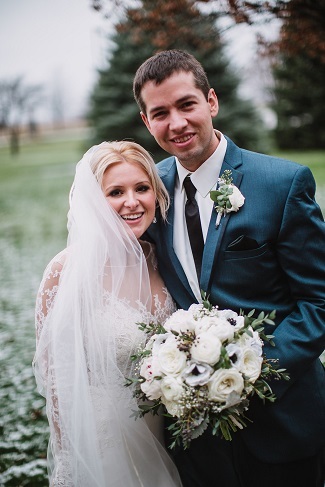 Her vision was to have lots of white blooms, candles and soft colors to keep the focus on her and Ryan. My favorite memories from the day include, my mom and sister helping me with my dress, the first look with my dad, seeing Ryan smile at me as I walked down the aisle and dancing with friends and family who mean the most to us. 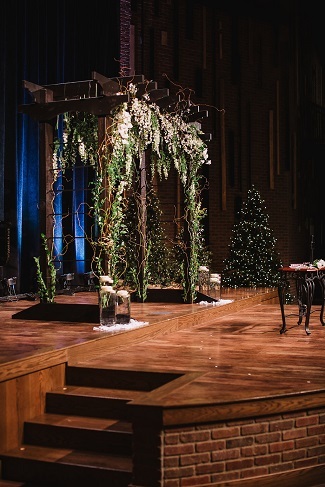 I will always remember that we felt completely surrounded by love as we made a commitment to each other before God (and in front of our families) and of which we will always honor – that was the most memorable part of our day! 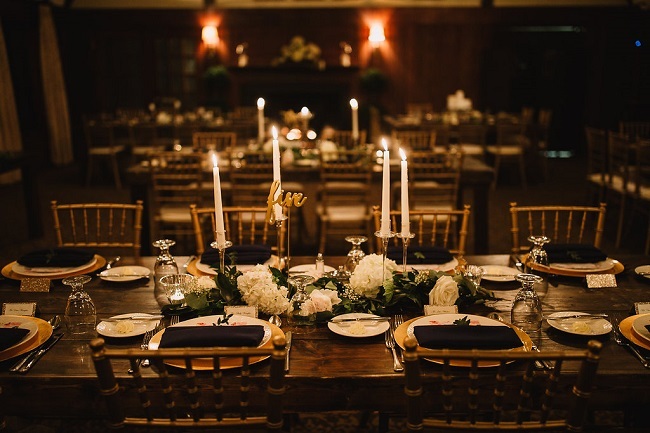 Jenna’s advice to future brides is to not let the details, decision making and being caught up in wanting to have everything perfect overshadow what the day is all about – marrying the person you love and being surrounded by family and friends. 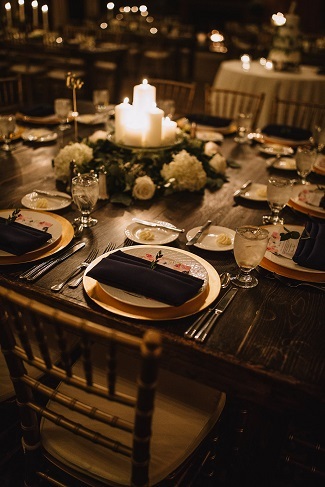 Let us help you plan your dream wedding!! Call or text 209-212-6570 or email fancyfloralsbynancy@hotmail.com to receive your free consultation. Get free tips from our real brides! Enter your email address to receive these tips and notifications of new posts!